Pave smarter, faster, and more efficiently with today's intelligent compaction (IC) roller technology. IC technology provides instantaneous feedback to a roller operator on the stiffness of the material and where compaction has been applied. Some IC rollers can also provide a surface temperature profile for the material being compacted. This information can then be used by the roller operator to apply the right amount of compaction, at the right time, to achieve the specified material stiffness. 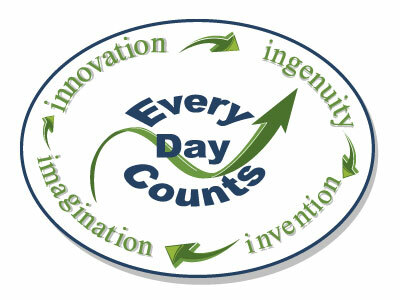 The Federal Highway Administration (FHWA) is promoting the deployment of IC technology through the second round of its Every Day Counts (EDC) program. Launched in 2010, EDC focuses on deploying innovations with proven benefits in shortening the time needed to complete highway projects. Many of the innovations offer additional benefits such as enhanced safety, improved quality, and reduced impact on the driving public. IC technology uses an advanced dynamic evaluation device (accelerometer) positioned on or in roller drums to measure the response of the underlying paving materials to the compaction forces being applied by the drum. The accelerometer readings are then analyzed by an onboard computer that takes the readings, instantly calculates a stiffness value for the material being compacted, and provides the values in a graphical display to the operator. These values are also stored and can be downloaded either manually or wirelessly for use in a quality assurance program. The rollers are equipped with global positioning system (GPS) technology that tracks the roller drum locations in real time. A color-coded display assists the roller operator in assuring that 100 percent of the pavement is being compacted. The onboard computer also links the stiffness value and other measures with the respective GPS location data to produce a complete map of the roller's operation. This information is provided back to the operator to help him or her make the necessary adjustments to assure quality in the compaction process. Some IC rollers are also equipped with real-time surface temperature measuring and mapping equipment. Surface temperature data helps the roller operator apply compaction at the optimum temperature to achieve increased effectiveness and quality. 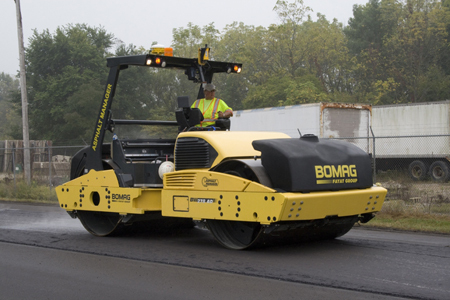 IC rollers can compact a greater amount of pavement with just enough passes to meet the specified stiffness, allowing transportation agencies and contractors to increase production while achieving time, cost, and fuel savings. Using IC rollers also improves the quality of compaction operations, resulting in longer-lasting pavements and reduced maintenance costs. The technology is offered on both single-drum rollers for soil and aggregate base materials and double-drum rollers for asphalt pavement materials. IC technology can be purchased as standard equipment for new rollers. Retrofit kits are available for most existing equipment fleets. Improvements continue to be made to these kits. FHWA's IC deployment initiative follows several years of collaborative work with State transportation agencies, contractors, and equipment manufacturers to refine and demonstrate the technology through field projects, training sessions, and open houses. In 2011, FHWA completed a 3-year transportation pooled fund study, "Accelerated Implementation of Intelligent Compaction Technology for Embankment Subgrade Soils, Aggregate Base, and Asphalt Pavement Materials" (Project No. TPF-5(128)). As part of this study, 16 IC demonstrations were conducted in 13 States. Since 2007, FHWA has funded research on the use of IC for quality control testing. State partners have included Utah and Florida, with testing also scheduled in Ohio, California, and Maine this summer. The study on "Intelligent Compaction Density Evaluations of Hot-Mix Asphalt Pavements" is scheduled to be completed in 2014. "While no conclusions have been reached yet on using IC for acceptance testing, the research is reinforcing the value of using IC for quality control during construction," said Richard Duval of FHWA. FHWA's Federal Lands Highway Division office is currently using IC rollers for a 14-km (8.7-mi) roadway rehabilitation project on U.S. Highway 82 in New Mexico's Lincoln National Forest. The rollers are being used on both the full-depth reclamation base layer and the hot-mix asphalt pavement. "Even though it is early in the project, the information we are receiving from the IC rollers is helping our roller operators complete the compaction of both the subgrade and asphalt. We have seen increased coverage consistency and an overall improvement with roller activities," said Dan Lurtsema of project contractor Mesa Verde Enterprises. To date, the precision of the GPS data has been good. To learn more about the project, contact Mike Voth at FHWA, 720-963-3505 (email: michael.voth@dot.gov). Following FHWA's implementation initiative and demonstration projects, many contractors have purchased IC rollers and are now using them to accelerate construction and decrease fuel consumption. To learn more about IC and the many implementation resources available, including generic specifications, technical briefs, and training opportunities, visit www.fhwa.dot.gov/everydaycounts or www.intelligentcompaction.com. Information is also available by contacting Antonio Nieves at FHWA, 202-366-4597 (email: antonio.nieves@dot.gov). Additional details on the IC process can be found in the April 2008, April 2010, July 2011, and July 2012 issues of Focus (to view back issues of Focus online, visit www.fhwa.dot.gov/publications/focus/past.cfm). A thin lift of hot-mix asphalt is compacted with an intelligent compaction roller on U.S. 52 in West Lafayette, IN. 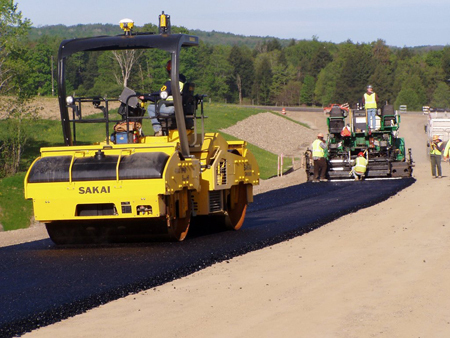 An intelligent compaction roller is used to place a hot-mix asphalt lift on U.S. 219 in Springville, NY.